The One Where: Sylar returns from the dead, only to find that his powers have deserted him. In California, Claire and West confide their secrets in one another while Bennet finds a painting that points to his imminent demise. Verdict: Was there ever any doubt that Heroes’ head-slicing supervillain would return? Of course, like all good supervillain resurrections, the circumstances of his survival are pretty much fudged (we’re only told Candice performed “eight surgeries”...). And can anyone watch Zachary Quinto now without picturing him with pointed ears and a Tricorder in his hand? Good to see Nichelle Nichols and Enterprise’s Dominic Keating, furthering the Trek/Heroes talent swap drive. Pete’s Irish robbery plays like something out of Dixon of Dock Green, though. Maybe it’s the flat caps? Highlight: "Claire, shut up!" 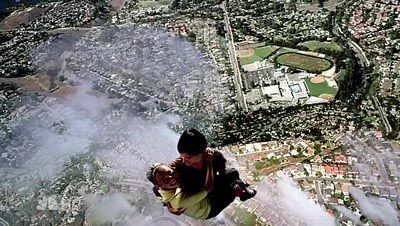 West and Claire’s flying scene has a definite dose of Superman/Lois magic. Fab FX: That fantastic pullback when Sylar realises he’s in a shack in the middle of the rainforest. And let’s hear it for the unsung sound FX, too – the crazed ticking when Sylar kills again is a brilliant touch. Hmmmm...: So West is a former victim of HRG. Just coincidence he’s in the Bennets’ new neighbourhood, then? Star Turn: Nick D’Agosto is immensely likeable as West, playing him with a real lightness of touch. And Hayden is great in the emotional scene where she tells him she’s a freak. Matt: "Mohinder, no offence – you’re a professor, not 007."